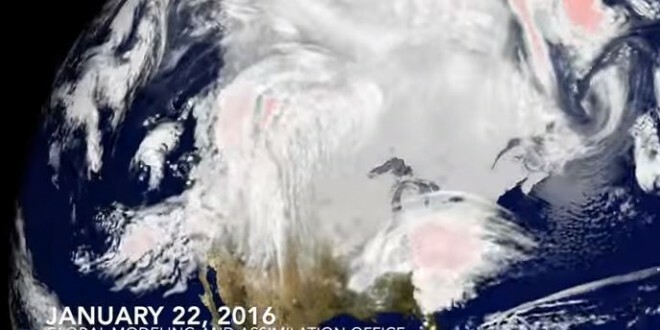 NASA's Supercomputer Models Blizzard [VIDEO] - Joe.My.God. The near-real-time operational GEOS-5 system ingests more than 5 million observations every six hours producing comprehensive analyses and forecasts of the atmosphere each day at 25-km global resolution. This experimental product uses the global mesoscale capabilities of GEOS-5 to downscale the operational product to 6-km global resolution. Subsequent forecasts are launched with this product providing a detailed view of the developing storm and its predicted evolution across the region. The simulated field visualized here is outgoing longwave radiation (OLR). Clouds block longwave radiation that is emitted from the Earth’s surface producing cold OLR values in regions of thick/deep cloudiness. Thus, OLR provides a satellite-eye view of clouds from storm systems around the globe, including the developing blizzard across the eastern United States.